It’s Wednesday, which is my Hump Day Hack day. If you’re like me, you buy some lovely ciabatta or other artisan buns for a recipe and then end up with leftover bread. Well, transform it into EASY croutons. Ciabatta works best but French and Italian loaves are great, too. If you don’t have time this week, you can freeze the bread and then defrost it on the counter ad make croutons next week. Slice up 1 ciabatta or other bread into bite-size pieces. 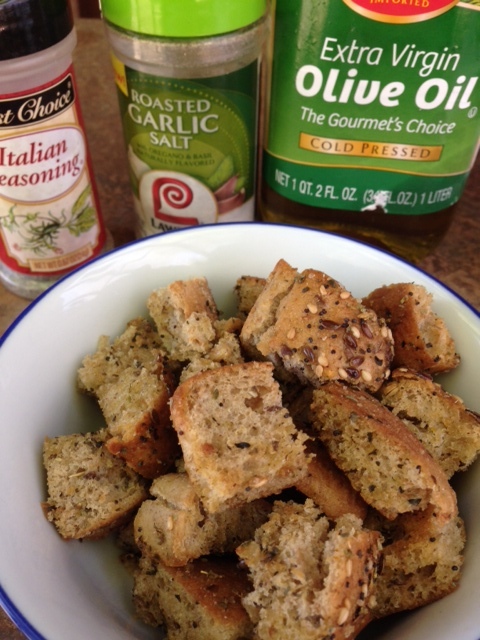 Drizzle with olive oil and use your hands to toss the bread to incorporate the oil. Then toss with Italian seasoning and a generous dash of garlic salt. Toss to coat. Bake for 8-10 minutes, until crisp. These will keep a few days (depends how soon your bread will expire and if it has preservatives) but are best enjoyed fresh. They are amazing hot! Here’s another wonderful way to use artisan bread before it goes bad. You can use it to make dill toast for smoked fish, like smoked salmon or trout. It’s FABULOUS. To do this, take your ciabatta or French bread and brush it with olive oil. 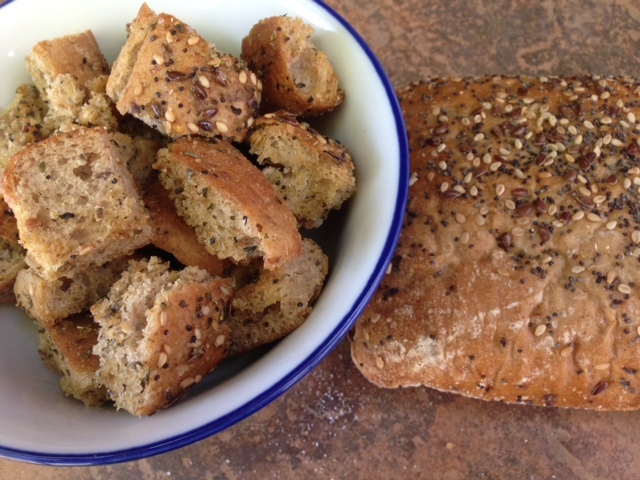 Then sprinkle dried dill weed on the bread and a dash of salt. Bake it at 400 degrees for 5-10 minute, depending on how toasted you want it. I prefer it at about 6 minutes. Then spread cream cheese or horseradish on the bread and top with smoked fish and capers. It’s simply delightful! And here is my second tip of the day: If you ever need to clean out your coffee grinder, fill it with rice and pulse until the rice becomes a powder. 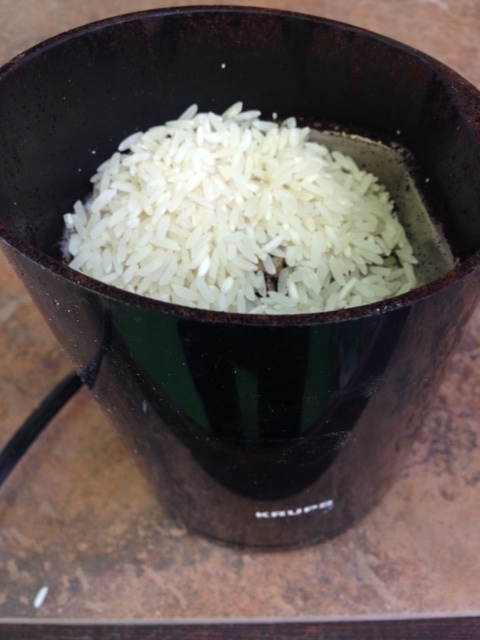 Then toss the rice and wipe the inside of the grinder with a damp paper towel. Why would you need to clean it? Well, sometimes you might want to use it to make bread crumbs or grind spices. There are a variety of reasons. 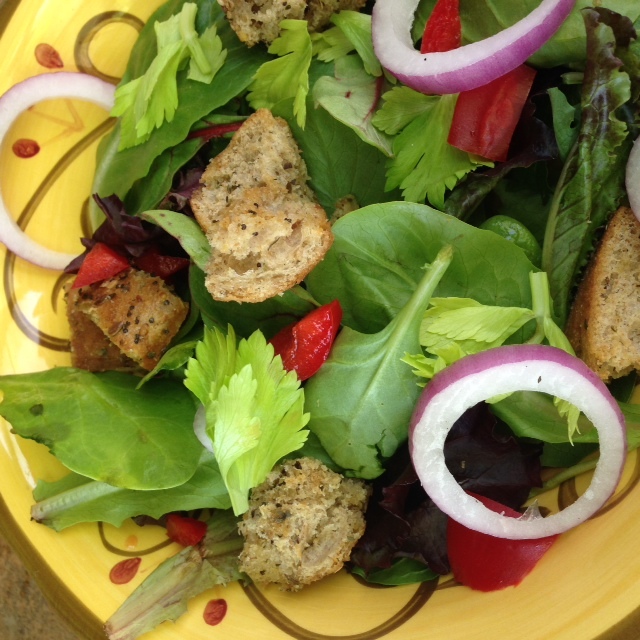 This entry was posted in Hump Day Hacks and tagged bread, ciabatta, clean, coffee grindersm, croutons, hump day hacks, leftovers, rice, salad, spices, tips on June 3, 2015 by Juliana Goodwin. It’s Wednesday, which I am calling “Hump Day Hacks and Tips!” I am excited about this new feature on my blog that will appear every Wednesday. Sometimes I share content I find, sometimes I share my own. Today, I share my own and I have two tips for you. My parents used to live in the Dominican Republic and when I visited them (back in college), I discovered the beauty of celery leaves. Most American cooks cut the leaves off and toss them– I used to do that– but it’s a mistake. First, I am advocate of using as much of every food as possible. And second, the leaves are intensely flavorful and nutritious. Celery leaves are high in iron, magnesium, and vitamins A and C.
In the Dominican, they used the leaves in marinades and that is a wonderful use, especially with chicken. But I have lots of other ideas, too. Celery leaves are great in stocks and broth. Because I have a ton of rotisserie chicken carcasses each week, I make my own stock. But on that rare occasion that I don’t, I still drop celery leaves, onions and bay leaves in commercial stock and boil for 10 minutes before I use the stock. I adds a lot of flavor. The more celery leaves, the better. Slice the leaves and use as substitute for parsley. 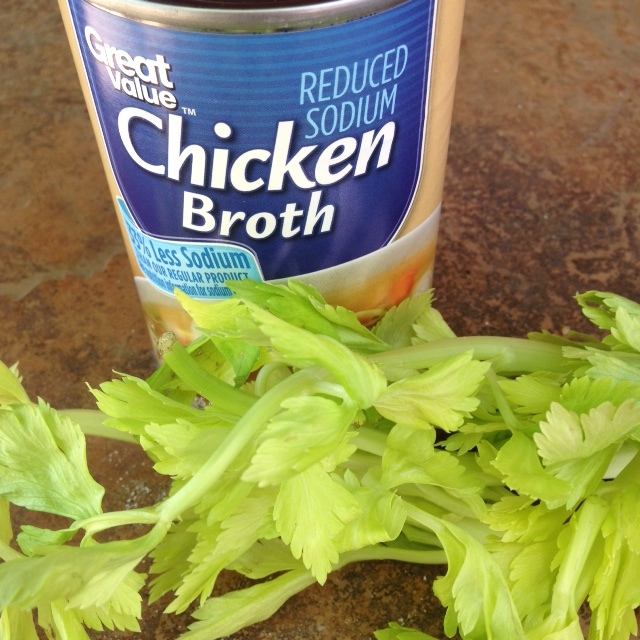 Toss chopped leaves into a salad to impart a celery flavor. It’s excellent. You can also add some to tuna salad or chicken salad. It adds extra flavor and nutrition. Mayo helps mellow out the celery leaf flavor. 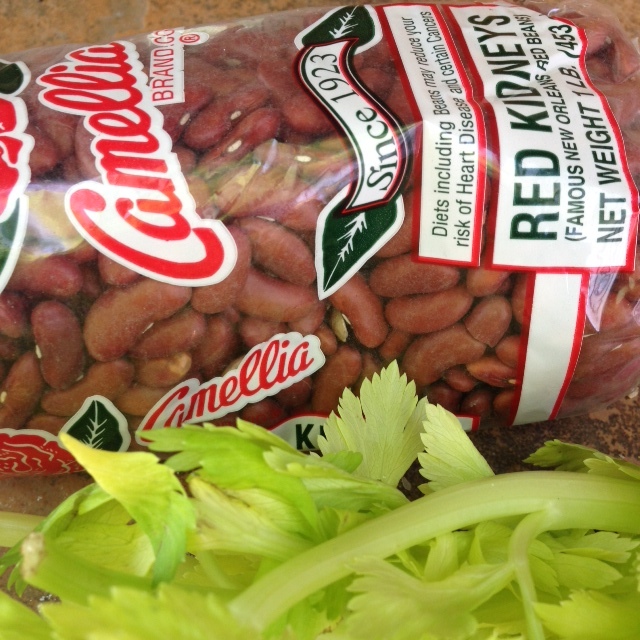 The leaves are excellent in homemade beans, both in the cooking process and sliced on top as a garnish. You can use them to garnish risotto or in rice pilaf or quinoa salad. 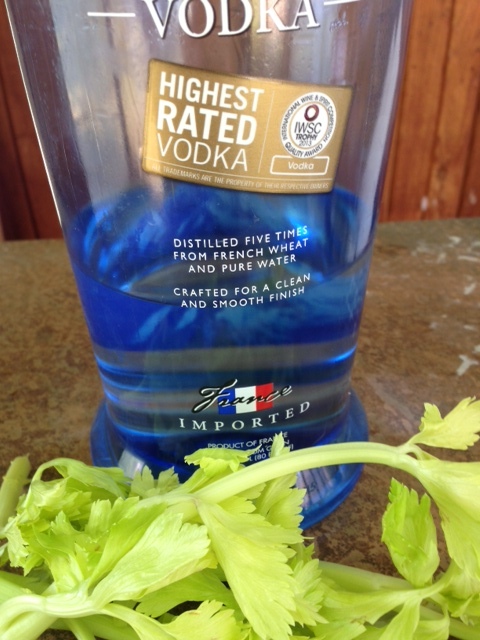 Use the leaves and a few stalks to infuse vodka for a fantastic Bloody Mary. Let’s see, it’s Wednesday, so go home tonight and add the leaves and stalks to vodka and Sunday morning, strain the vodka and enjoy a flavorful Bloody Mary. You can also add jalapenos if you like it hot. And save back a stem with some leaves on the top to garnish that Bloody Mary with olives. A thincelery stalk with leaves on top makes a great olive skewer. Ok, I hope you never throw away celery leaves. There are too many reasons not to. My second tip is a lot quicker. I was at a friend’s house about a month ago and she over-salted her soup. I told her next time she does that, to place a few small potatoes or slice up a large potato, and put it in the broth as it cooks and the potato will extract some of the salt. You should peel the potato before you add them. 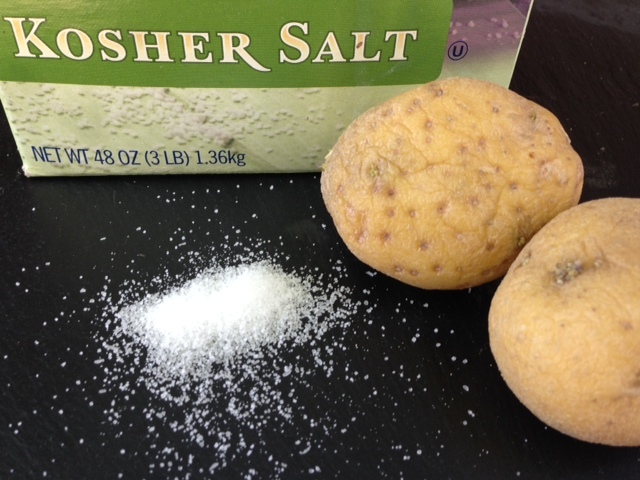 You don’t want to cook the potato through and you may have to repeat the process, but it will help reduce the salt. Just think about how much salt potatoes need. It’s a great solution for over-salted stock. That’s it for today. Join me all week for rotisserie chicken recipes and Hump Day Hacks and Tips on Wednesday. I will start adding a weekly travel feature, too. I am thinking about Travel Tuesday or Travel Thursday. I have visited 57 countries, every continent and 45 states, so I have LOTS of travel tips and advice. This entry was posted in Hump Day Hacks and tagged beans, Bloody Mary, celery, celery leaves, chicken salad, Dominican Republic, don't waste food, hack, helpful, hints, marinade, nutrition, nutritious, over salted, potato, salad, solution, soups, stews, tips, useful on April 29, 2015 by Juliana Goodwin. 45 Amazing Kitchen Life-Hacks That Are Absolutely Genius – DIY & Crafts. This entry was posted in Hump Day Hacks on April 15, 2015 by Juliana Goodwin. I am not talking about rotisserie chicken today. Instead, I am talking about orange zest. How many times a week do you eat an orange or send one to school with your child? Well, if you’re not zesting that orange first, you’re wasting valuable nutrients and flavor. I add it to extra virgin olive oil to make salad dressing; add it to salad (it’s particularly good on spinach and arugula); use it on salmon (lemon zest, too); put it on my oatmeal with some cinnamon and dried blueberries or cranberries and walnuts; sprinkle it on toast with strawberry or raspberry jam; use it to infuse water; add it to cookies or breads; stir it into couscous or quinoa; or even add it to a smothered pork chop with cranberry sauce (see recipe below). You will get a little less than 1 tablespoon of zest per orange, depending on the size, and that contains 14 percent of your recommended vitamin C intake. So you are literally tossing nutrients if you don’t use that peel. For best results, zest an orange before you slice it. If you’re not going to eat the orange for a few hours, then wrap the orange in plastic wrap to protect it or it will start drying out. On that note, the peel does protect it, so don’t go crazy and zest citrus that you don’t plan to consume today. I have a three pound bag of oranges on my table right now and that’s a lot of potential zest, flavor, and Vitamin C.
You can also freeze zest, too. I put it in a plastic baggie and pop it in the freezer, but only if I have several oranges worth in the bag. Ok, have I convinced you to start using that orange peel? I hope so. Here’s a super easy recipe: Salt and pepper your pork chops. Then toss in flour, seared in hot oil on each side and then add 1 can whole cranberry sauce, 1 teaspoon orange zest, ½ cup orange juice, 1 chopped garlic clove and cover with a lid and simmer on the stove for 10-25 minutes, depending on how thick your pork chops are. This entry was posted in Hump Day Hacks and tagged easy, healthy, kitchen hacks, life hacks, nutrtious, orange zest, peel, tips, useful, vitamin C on February 6, 2015 by Juliana Goodwin.